We have been providing seamless, reliable, secure and cost-effective managed IT solutions to a wide range of customers across the world since 2003. With our wide expertise and customized service packages, we provide enterprise class experience while meeting your end-to-end business requirements. 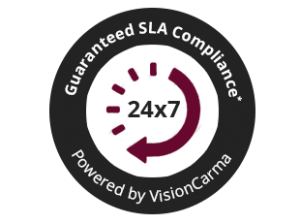 VisionCarma, our enterprise-class work management system allows you to manage your support engagements through its real-time SLA metrics & performance. Carmatec workforce is driven by visionary technologists, certified operations engineers and technicians who are well versed with cutting edge technologies and equipped with the right tools that encompass today’s technology landscape. 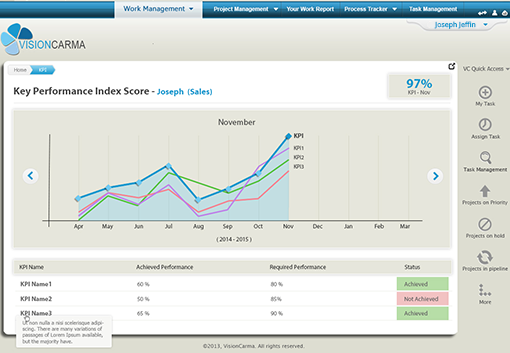 A peek into VisionCarma dashboard and features. Efficient, speedy delivery of business solutions require a robust IT infrastructure that is modern, reliable and fast. Our skilled technicians ensures the continual, always on environment of your organization. This includes work stations, PDAs, storage and network. For a wide range of on-premise or remote support for your Operating systems, applications etc. and also managing IT infrastructure, monitoring, security audits and compliance solutions, do get in touch with us today! Our dedicated team ensures that the business uptime is upheld across all business ecosystems. Service consists of level 1, level 2 and Level 3 support depending on escalation and seriousness of event. Cost, utilization and returns are rationalized according to the business goals and requirements. Organizations can profit through reduced cost spending on infrastructure. Carmatec’s Server Management Service team is particular about periodic backups of business-critical information and also strives upon improving the effectiveness of storage systems and end-user efficiency. Our solid disaster recovery system means one thing for you and that is- Business continuity. Carmatec guarantees dependable and failover environments that are maintained 24×7. Bugs in software, data breaches etc. can cause huge scale issues. Likelihood of DDoS attacks or a hack can be decreased but not eliminated completely. Our administrators constantly look out for all options to decrease the possibility of a security breech. 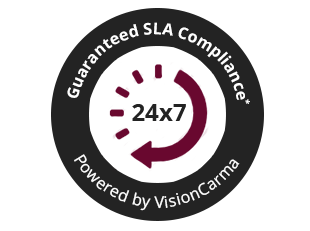 Your mission critical applications and tools need expert and vigilant eyes monitoring your hosted infrastructure 24/7/365. Our team of datacenter technicians use automation tools and rigorous SLA driven incident management strategies. We remotely manage your applications and collaborate effectively with your in-house or datacenter staff. One of the most significant offering we provide is Server Setup and Support. Carmatec technicians are experts in setting up new servers and adding a whole lot more roles and services on existing servers. As part of a support plan, our Server Management team manages all of your servers, not just the ones we installed. Carmatec’s highly efficient team can work with you through the whole server life cycle, i.e. from initial server setup by employing security hardening to scheduled maintenance and optimization. Application Server Management is tailor-made for those customers who possess custom control panel built or servers without control panel. Be it Windows/Linux hosting, Debian, Ubuntu, FreeBSD or Application Server. Our experts are ready to handle your servers 24×7 at reasonable prices! Linux Server Management offers you services of our certified system admins to fix issues related with different flavors of Linux operating systems, wide range of opensource tools and services. Windows Server Management offers you services of our certified windows system admins to fix issues related with IIS, PHP, MS SQL and ASP based sites. Carmatec’s best practices guarantees that your cloud investment keeps functioning effortlessly and get continuously improved to generate the highest possible return. Carmatec’s Cloud Administration Services are conceived to greatly enhance daily operations and support by maximizing quality and effectivity. These services can also minimize down-time linked with unmanaged/unplanned adjustments. Server Hardening is the process of improving server security by means of improvements such as firewalls, data encryption, using network ports intelligently, maintaining backups, etc. Installing patches as needed – we do this on a regular basis. Initial hardening of the operating system. Allowing only select IPs access to Remote Desktop / Windows Terminal Server. Disabling storage of insecure version of passwords. Recommended Registry key configuration to thwart DoS attacks. Using Windows Group Policies to stop known Worms and Trojans from running. Configure strict metrics for password aging, etc. Regular log analysis for proactive maintenance. Installing patches as necessary- We do this on a regular basis. Removing regular user and world access from c compilers. Installing chkrootkit and set up in cron. Installing root kit hunter and set up in cron. Installing rootcheck and set up in cron. Allowing certain IPs access to SSH. Recreating the /tmp directory on its own partition. We deliver a full range of PCI services, from web-based portals featuring on-line PCI self assessment questionnaires and vulnerability scanning services, to technical audits and full penetration tests. We provide Kernel Hardening/recompilation/applying grsec patch for better security. This includes- Openwall, LIDS, LoMaC, NSA Security Enhanced Linux, etc for increased security.